All Seasons is a non-smoking family-run traditional Lakeland guesthouse. 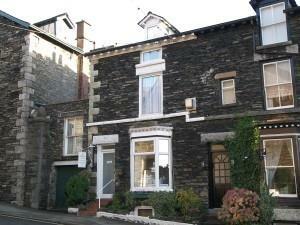 It is close to the bus and train stations and is ideally situated for all trips and tours round the Lake District. All guests have access to local leisure facilities at the Old England Hotel (pool, steam room, sauna, gym, spa). Golf, horse riding, cycle hire all bookable nearby. Children welcome from age 3. All Seasons Guest House sometimes limits bookings to 3 or more days. Family room with double bed and one single bed. Room can also be let as a double. Family sometimes limits bookings to 3 or more days. Family room with double bed and two singles. Room can also be let as a double. M6 jct 36, A591 to Windermere. From A591 take Elleray Road into Windermere. Take first turn left into High Street and we are half way up on the right. From bus and train station walk down past the tourist information centre, look to your left and you will see the Lakes Hotel. Take the road to the right of this and we are halfway down on the left. The host were warm and friendly except room a little bit too small.